Admire the natural wonders of the Bay Islands, Honduras from our high end vintage boats, Ruthless and Reel Action. 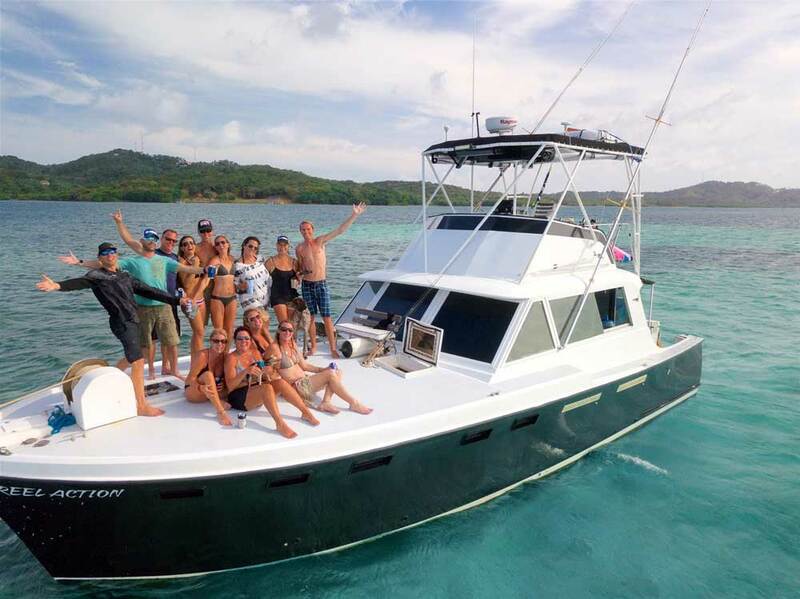 Whether you are fishing, diving, snorkeling, or just out for a good old fashioned booze cruise, you are guaranteed fun on the boats of Ruthless Roatan Charters. Take the original audio from a 1960’s Hatteras commercial and combine it with our boats cruising the open ocean, equals pure magic! Check out the video below to see where we've been. See our 42' Hatteras yachts, Ruthless and Reel Action, gliding over the clear blue waters of Roatan while fishing and enjoying the views. We love taking guests along the Northshore of Roatan and to Cayos Cochinos. Our Northshore day trip combines the beauty of clear, turquoise water and the most private, exclusive snorkeling locations Roatan has to offer only a short boat ride away. As we take you on the inside of the reef through mangrove cut outs you can take in the dramatic views of our islands lush, green hilly landscape. Plus get to experience the Garifuna culture in Punta Gorda. Learn more about the extremely comfortable boat ride and unforgettable fun you can with us as we spend the day exploring Roatan's Northshore. Over 253 of our guests shared their "Excellent" experience with Ruthless on Trip Advisor. See what they had to say. Our vintage, luxury boats offer the best of dependability and comfort to our guests. We proudly maintain both boats to the highest safety standards so they are ready to handle any condition the ocean may send our way. They offer sun, shade, and indoor seating area and bathroom facilities. Our flybridge up above always offers a breeze and a Captain who will happily tell you stories and tales of the boat and of Roatan. Take a closer look at the interior and exterior of both our boats in our photo gallery. We're always happy to answer any questions you may have about our boats and if they are right for you. Nothing is better than jumping onto our boat in the afternoon for fishing, catered appetizers, a cold beverage (or two) in your hand with views of the sunset glistening off the water. Our sunset cruises are the perfect addition to any holiday in Roatan as they run 2.5-3 hours long, pickup in the heart of West End, and take you for a leisurely stroll up and down the coast. If we happen to catch some tuna, we will happily serve some of the freshest Sashimi you might ever try! Everything about the whole process from booking, deposits, arrival, was seamless. Michelle and Tim clearly run a very tight ship (haha!). Every member of the crew was super focused on making sure everyone aboard was comfortable, having a good time and had everything they needed - the hospitality I was shown was really more than I had expected - from the food and drinks to the sight-seeing and education about the area.